Utricularia alpina is a real must for all plant enthusiastics.The Utricularia alpine is an orchid-like flowering, epiphytic plant. The exotic flowers of this Utricularia are relatively large and really striking. Belowground near the roots the Utricularia alpine has snares to catch and digest small insects. 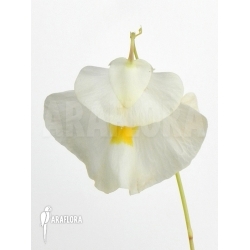 The Utricularia alpine is an indigenous plant from the north of South- America and from the Antilles. This type of utricularia is epiphytic and therefore does not grow in the soil but on other plants. It is successfully cultivated in plant containers. You can grow it indoors on a window-sill or in a plant display case with artificial light. The flowers are large in relation to the plant itself; they develop from the tall flower stalks. The flowers that grow yellow spot in the middle. The snares used by the plant to catch insects are small and for the most part belowground.